The lightweight, nimble and fast-moving "Premium Rush" is a fun ride that's a cool end-of-summer treat. Its flashback-and-forth plot is more silly than smart, but nobody goes to an amusement park looking for mental stimulation. Sometimes, simple-minded pleasures are the best. Joseph Gordon-Levitt, whose last three movies were the dreary "The Dark Knight Rises," the dopey "50/50" and the dense "Inception," gets to go outside and play as a sunny bicycle messenger known only as Wilee. Daring or foolish enough to use a one-gear, no-brakes "fixee" to race through New York traffic for a living, he prefers the joys of those not-so-open roads to working in an office. A lot of other law-school alumni may be forced to settle for low-paying jobs these days, but free-spirit Wilee willingly passed up taking the bar in favor of taking the handlebars. In the movie's first shot, Wilee arcs through the air to land in the street at 6:33pm. Time rolls back from there to show him taking the end-of-day assignment that will lead to the accident, a job that involves transporting an envelope from his alma mater to a Chinatown restaurant. The story takes several other clock-rewinding backtracks to reveal how the actions of several characters turn the "premium rush" delivery into a life-or-death mission with international implications. Shannon deftly weaves between conveying genuine menace and almost cartoonish fury. He also bears more than a passing resemblance to actor Richard Kiel in his prime. Give Shannon a set of steel dentures and he could be the James Bond franchise's new incarnation of Jaws—if the 007 moviemakers collectively lost their minds. Also on Wilee's tail is a very frustrated bike cop, played with pavement-eating exasperation by stuntman Christopher Place. Other enjoyable cast members include the overmuscled and arrogantly cocky Manny (Wolé Parks) and Wilee's miffed girlfriend Vanessa (Dania Ramirez) as fellow couriers who may share more than a professional relationship. The chase-filled screenplay, cowritten by director David Koepp and John Kamps, shares Wilee's philosophy that "the bike cannot coast" and "brakes are death." 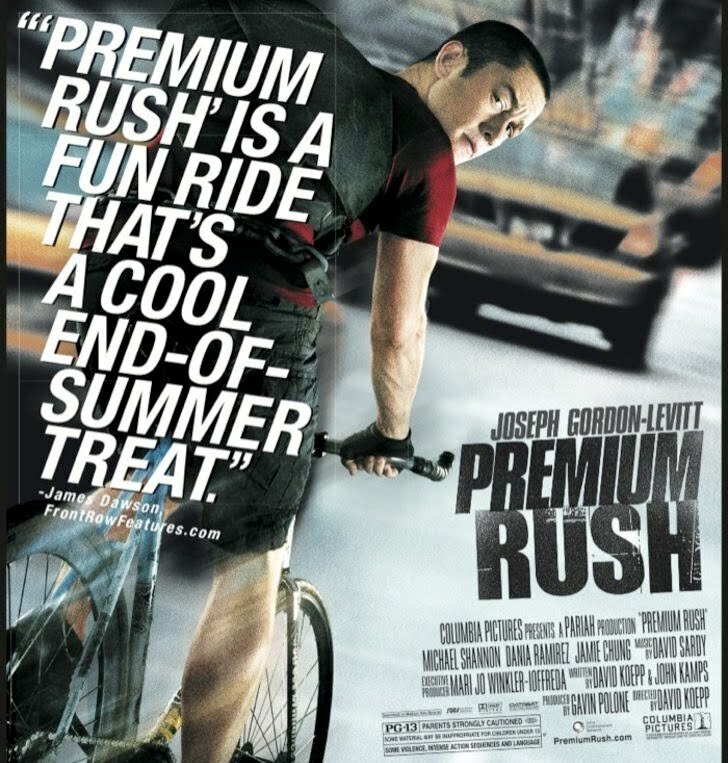 That makes "Premium Rush" the high-energy opposite of the gridlock-paced "Cosmopolis," this month's other movie about a trip across Manhattan. Scenes of Wilee and company recklessly dodging traffic, zipping through red lights and doing X-Games-worthy stunts are you-are-there exciting. A pursuit by a speeding car during a Big Apple rush-hour is as incredibly unlikely as it is entertaining. And three "Wilee-vision" segments, in which multiple-choice consequences of obstacle-avoiding options play out from Wilee's point of view, are cleverly done. What turns out to be inside the much sought-after envelope makes the movie's premise hard to accept. Someone simply placing a phone call could have saved everyone a lot of trouble by making Wilee's involvement completely unnecessary. The fact that a telephone actually is used later to deliver what's potentially a much more incriminating message only drives home this point. By that time, though, "Premium Rush" has built up so much feel-good headway that plot potholes can't slow it down. Note: A quote from this review was used in the movie's print ad, which appears below. (FrontRowFeatures.com is the syndicate that distributes my Back Row Reviews writings.) Unlike too many film critics who say they like everything in hopes of seeing themselves quoted as often as possible, I only give good reviews to movies that actually deserve them. Does this mean I am more honest and trustworthy than most other critics? Why, yes, that's exactly what it means.